Two paintings by Joseph Nawahi, 1877. When it was made known that Lava was erupting once again, along with it came the painting done by our good friend, the Hon. J. Nawahi; seen is the fiery red from Hilo, lighting up the walls of the heavens; and that painting can be seen in Whitney’s [bookstore] window. But this past Thursday, our famous seer artist did a painting of the fires of that woman of the pit, with the many Hiiaka aumakua igniting that fiery hot imu. Perhaps this is what some of our readers are saying; “the lava has reignited because of the aumakua;” that is ignorant. See this painting right outside of the printing office of the Pacific Commercial Advertiser [Kalepa]. 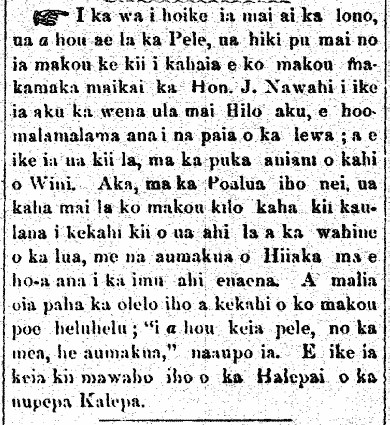 Ka Lahui Hawaii, Buke III, Helu 8, Aoao 3. Feberuari 22, 1877. This entry was posted in Eruption, Painting and tagged Hiiaka, Joseph Kahooluhi Nawahi, Pele by nupepa. Bookmark the permalink.